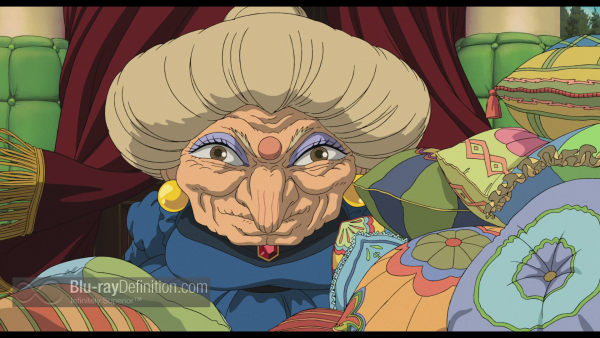 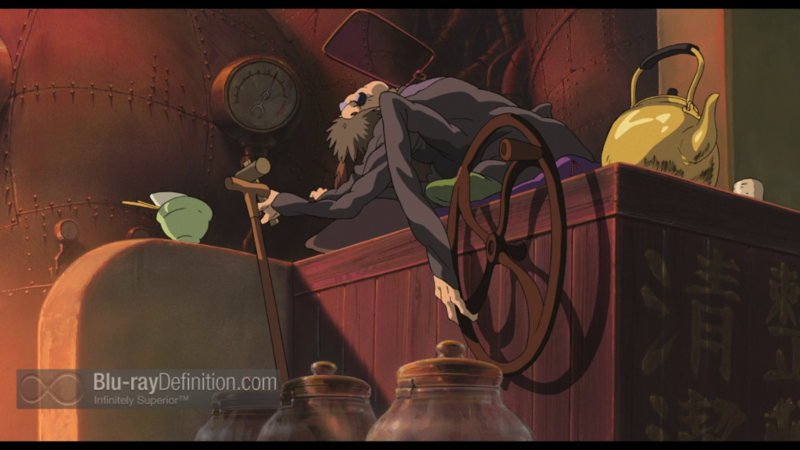 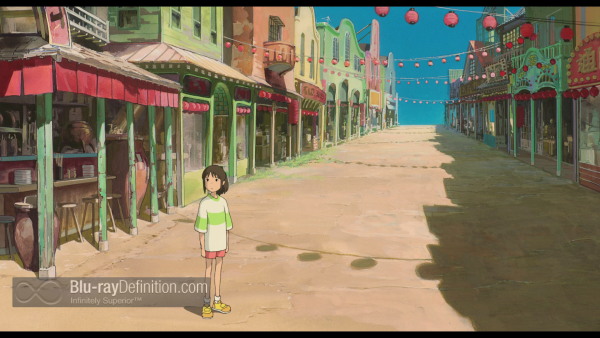 As our very own Chris Chiarella put it so eloquently in reference to Miyazaki Hayao in our 2014 Blu-ray Holiday Gift Guide, his works are “beautifully animated, but also displaying (some would say) more mature underlying drama than American audiences are used to, reflective of Japanese culture and ideals in service of universal stories” and perhaps Spirited Away, the 2003 Academy Award winner for Best Animated Feature, is one of the best examples of that. 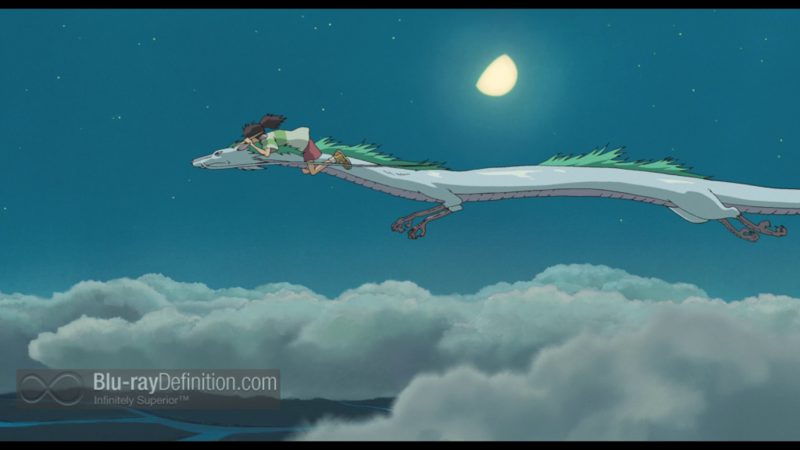 It is one of his most universal stories, a coming of age tale about a 10-year-old girl who must grow up quickly to save her parents, and it is one of his most adventurously animated. 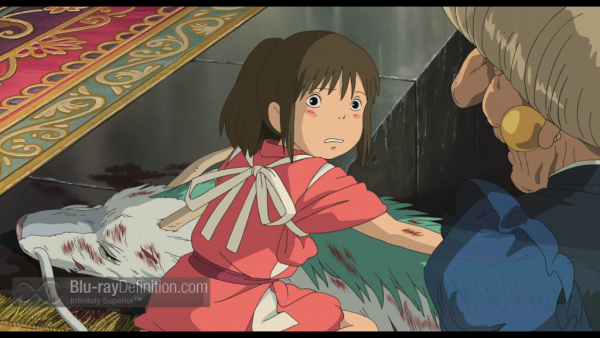 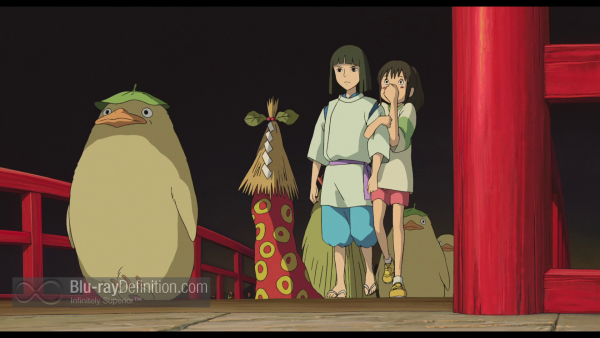 The follow-up to Miyazaki’s brilliant and successful Princess Mononoke, Spirited Away is a surreal and truly spirited fantasy adventure that revolves around 10-year-old girl Chihiro. While driving to their new home in the suburbs one sunny-drenched afternoon, Chihiro and her parents come across a tunnel on a secluded country road that leads them to what seems like a secluded amusement park. Despite the pleas of Chihiro, who seems very uneasy about the place from the beginning, her father presses on exploring and her mother follows along. Eventually they come across a stand with hot, delectable fare that the Chihiro’s parents help themselves to, planning on paying whenever, or if, the proprietors should ever show up. 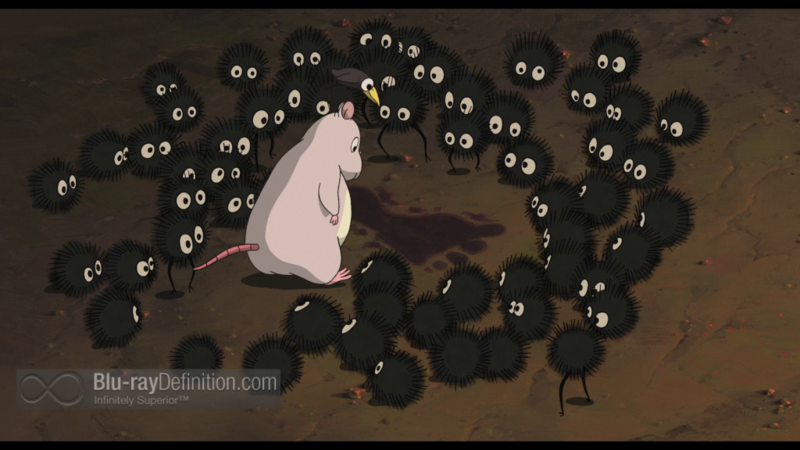 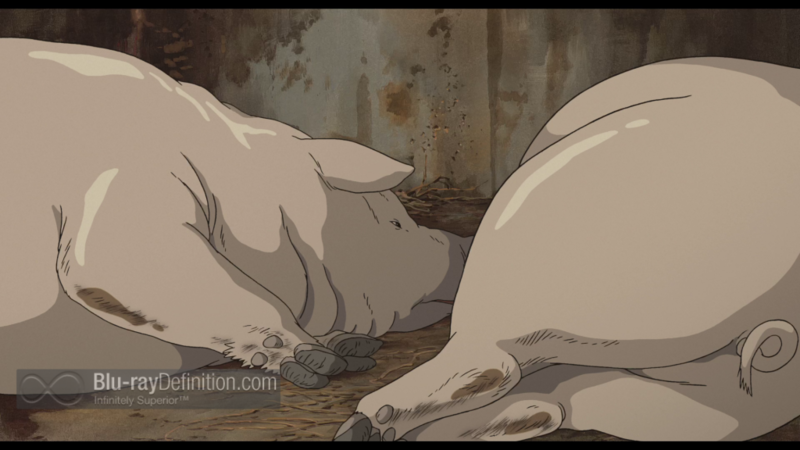 Then Chihiro witnesses her parents turn into giant pigs, and she runs away, frightened to tears. She comes across a boy named Haku who explains to her that she has come across a resort for various supernatural creatures who appear after dark, and that she must leave, but she doesn’t make it out in time. 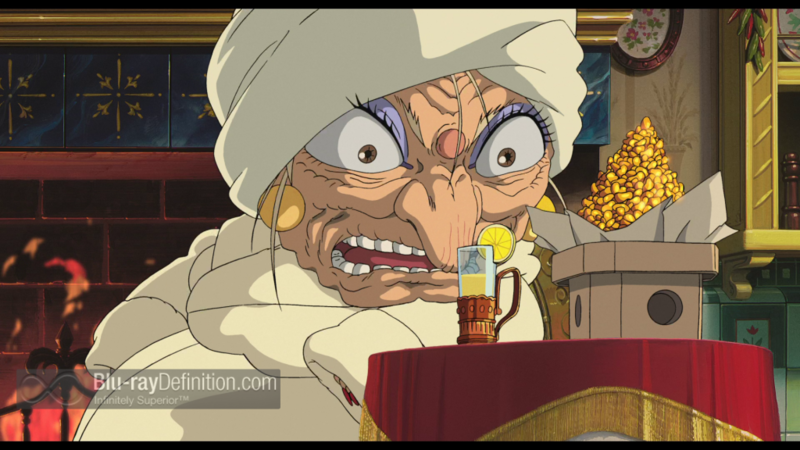 She must stay, get a job, learn the rules, sign a contract with the mean sorceress named Yubaba who runs the place, and change her name to Sen, but if she forgets her real name, she will forever lose her true self and never be able to leave or save her parents. 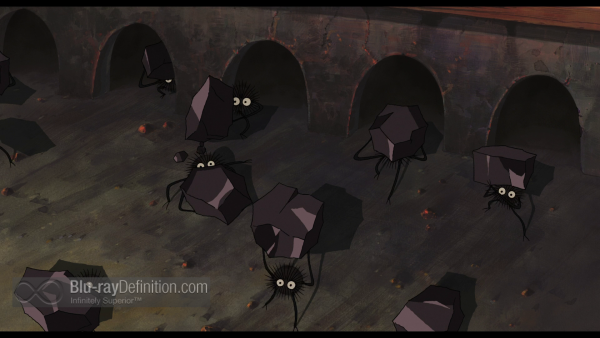 With Spirited Away, Miyazaki experimented with CGI in major way to create an amazing fantasy world of strange and weird creatures, from a giant mud god to tiny balls of soot that crawl around like bugs and carry blocks of coal. 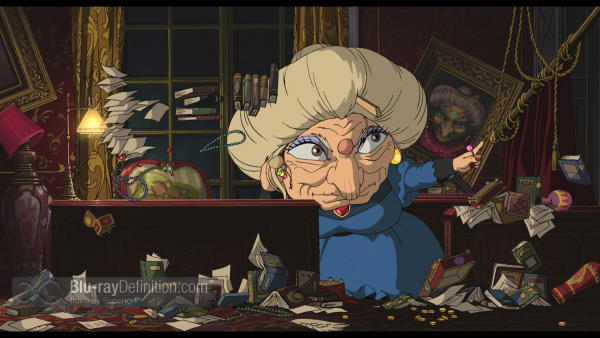 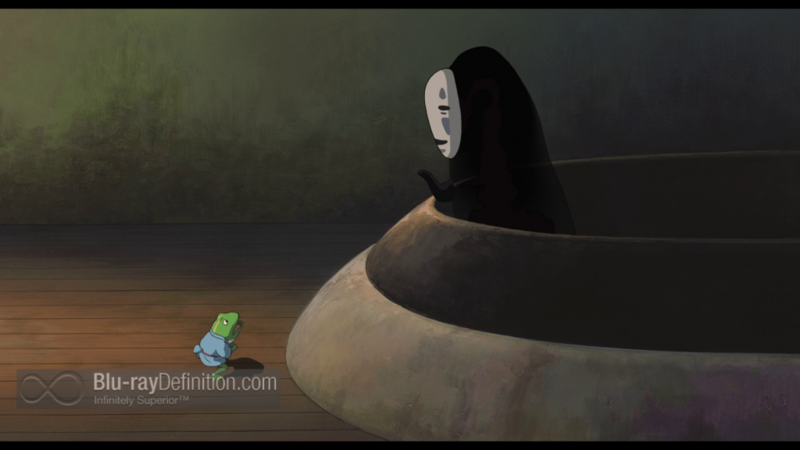 But the beautiful artwork is just icing on the proverbial cake with Spirited Away. The director brings together all of the best elements of his previous works like Princess Mononoke, My Neighbor Totoro and Kiki’s Delivery Service to form what is his most tightly woven coming of age story with an undercurrent of commentary on greed and consumerism. 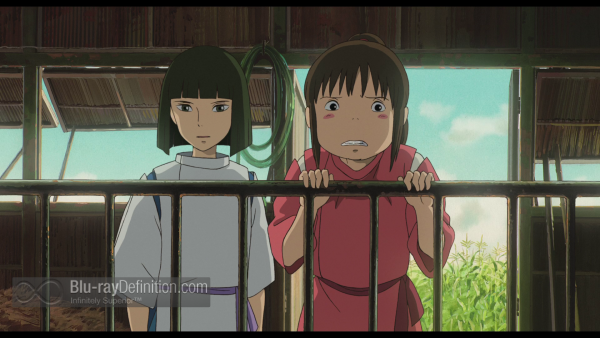 Chihiro begins her adventure a typical 10-year-old girl, but grows through her experiences in this peculiar world, learning about a work ethic, loyalty, and even love, both romantic and filial. And each step of the way, Miyazaki offers his commentary on our world’s destructive path of greed, with faceless monsters who swallow other creatures whole, supernatural creatures who lust after gold, and people turning into pigs because of their gluttony. 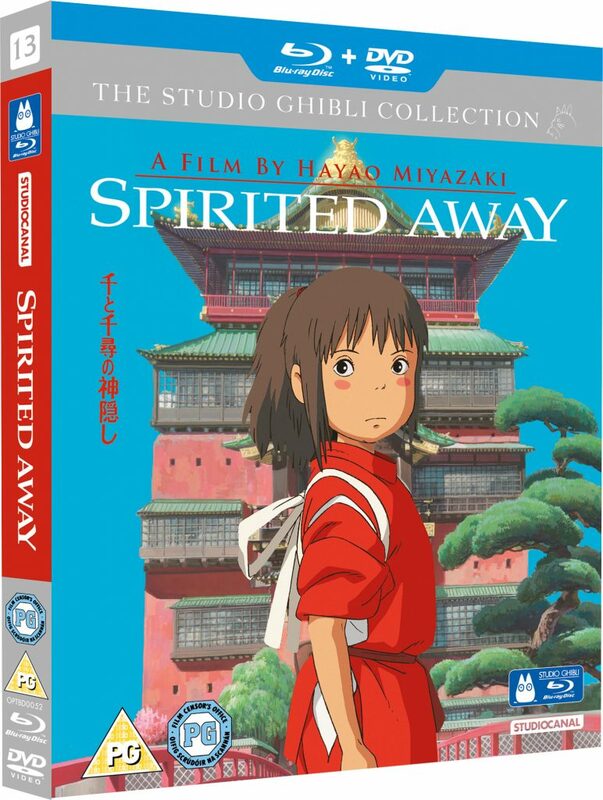 Spirited Away was a digital production so this transfer to Blu-ray from StudioCanal is as clear and crisp as one may imagine, free from noise and crisp in detail. 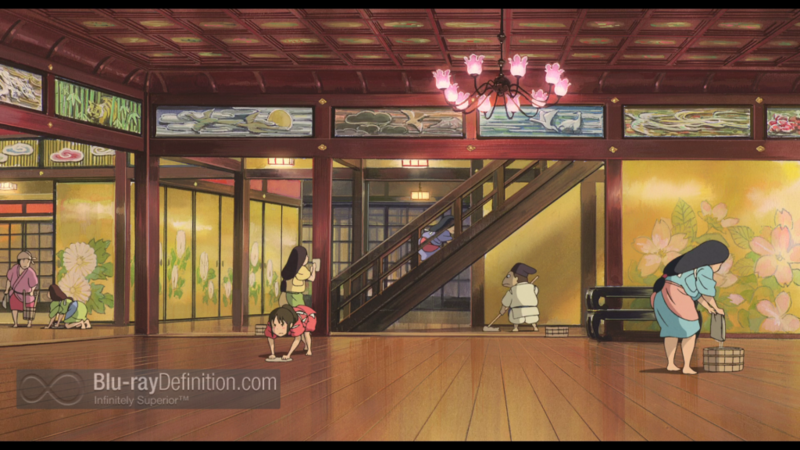 Contrast is strong and colors a good, but not overly saturated. The Japanese soundtrack is provided in a DTS-HD Master Audio 5.1 (48kHz/16-bit) mix and the English dub is provided in a DTS-HD Master Audio 5.1 (48kHz/24-bit) mix. 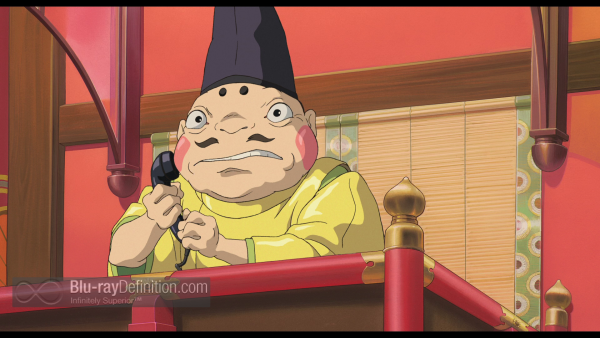 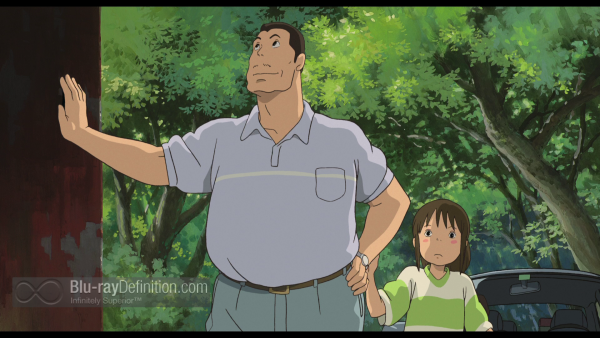 Outside of Michael Chiklis (Chihiro’s Father) and Lauren Holly (Chihiro’s Mother), there are no undisputed A-list stars in the English dub, and it shows in the somewhat bland voice acting. 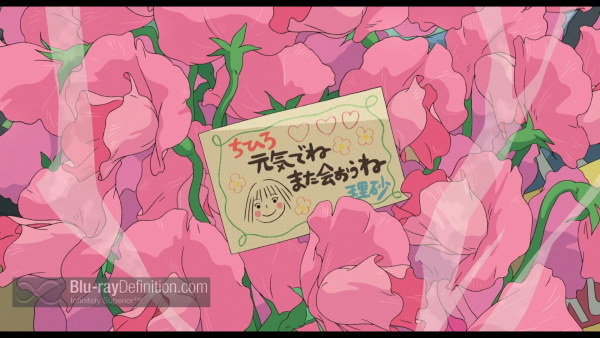 That said, the 24-bit track for the English mix does yield only a slight improvement in clarity and spacial depth. 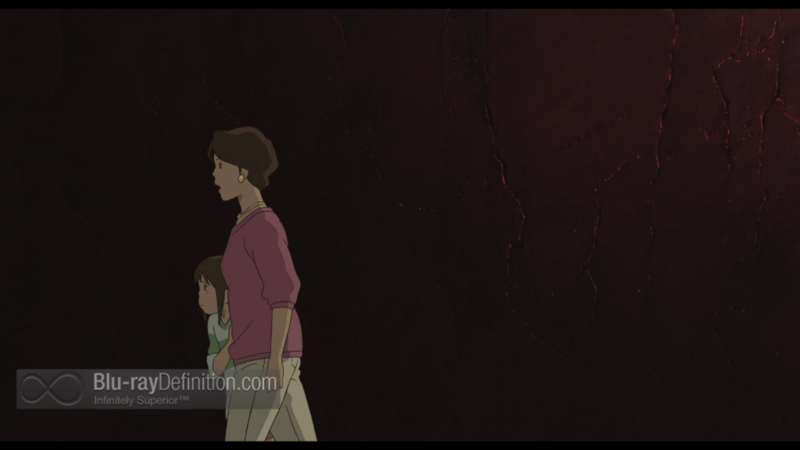 The mix itself, whether Japanese or English, has good balance and wonderful atmospherics — check out the opening scene with Chihiro and her parents walking through the tunnel for an example of how the reverberation surrounds you and sounds very lush. 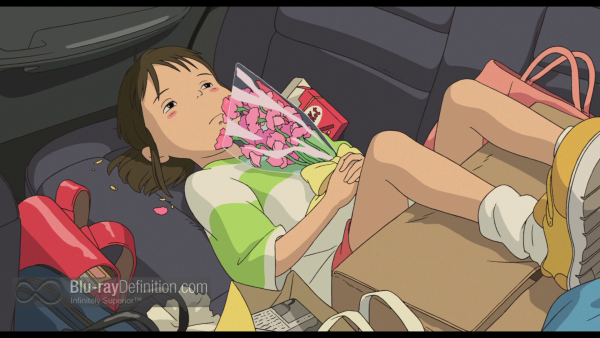 The low end packs good punch, but is tight and not unwieldy. 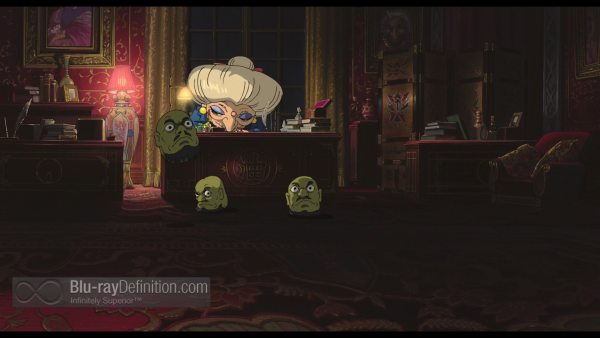 Behind the Microphone – Voice Talent Featurette – The English voice cast.